If you are a graduating senior or the parent of a graduating senior, please check out this fantastic opportunity to obtain an Associate Degree debt-free from UAM-CTC in Crossett! 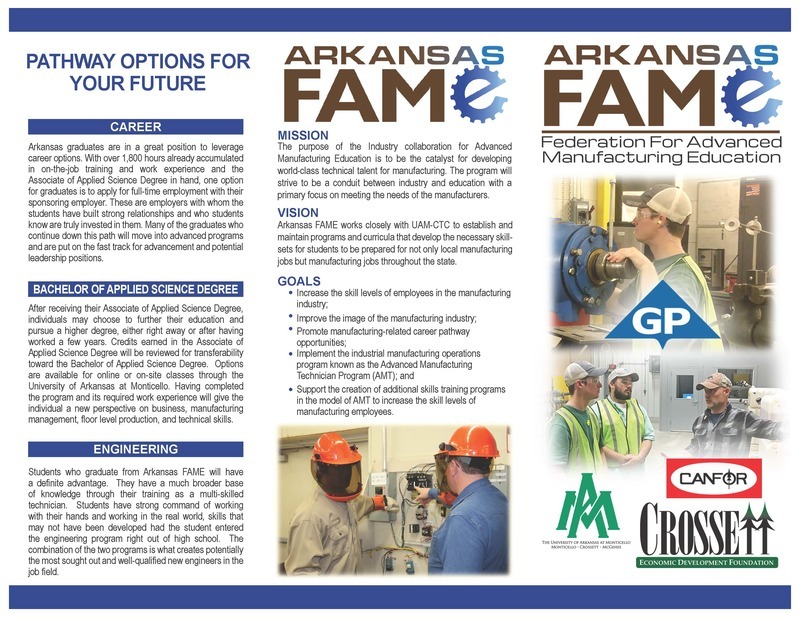 For more information regarding the FAME program, please contact: JULIE ROBERSON (Manager/Human Resources) at Canfor Southern Pine - (870) 962-3206. Applications are now being accepted for the FAME program. The FAME program is set up for two days per week of school at UAM-CTC in Crossett and then three days of work. Through the FAME program, students earn a beginning salary of $12 per hour and can earn performance raises up to $16 per hour over a two-year, five-semester period while earning technical certifications in pursuit of the applied science degree. With contributions from participating companies, students can finish the degree debt-free and have up to two years of on-the-job experience, an anomaly in today’s college and career preparation arena.